Review current and estimated tuition charges for BYU - H, and just how these prices contrast to the U.S. average. Get a good understanding of the tuition charges associated with BYU - H in order to plan effectively for 4-6 years. 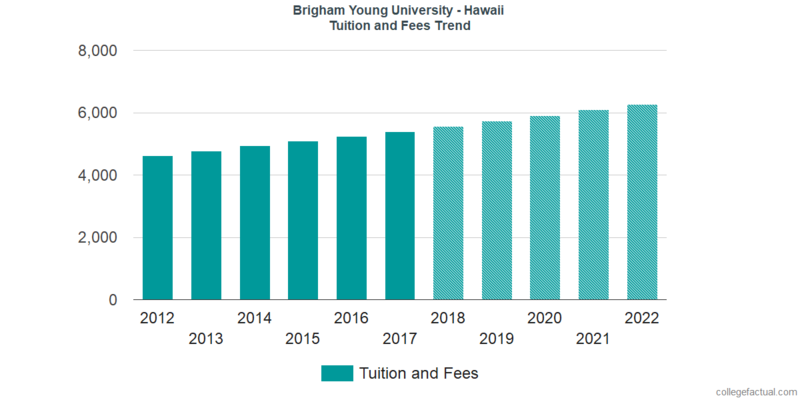 Check out the numbers following to understand how Brigham Young University - Hawaii's price compares to other colleges and universities and if you need to arrange for tuition increases. How Does Brigham Young University - Hawaii Contrast With Other Colleges? The following table shows how BYU - H compares to other colleges nationally, regionally and by state. How Much Does BYU - H Charge for Tuition? In the 2017 - 2018 school year, full time undergrads at BYU - H were billed $5,400, prior to adjustments for financial need. Of this amount, the price of tuition totaled $5,400. Unfortunately, this college doesn't provide any reductions to students who live in state. Brigham Young University - Hawaii tuition and fees is the number charged to students for one year of attendance, not including room and board. Yet, a lot of students will end up spending under maximum tuition because they qualify for financial aid and other reductions. Look at the following table to find 2017 - 2018 academic year costs. How much does BYU - H cost part time? There continues to be a rise of 3.0% in Brigham Young University - Hawaii tuition and fees for out-of-state students in the past five years. Tuition expanded by 3.0% and fees expanded by 0.0%. This school year, students can anticipate paying $5,565 if the growth keeps up. Because of price growth, the total expense of a four-year degree would be $23,298, and the total expense of a two-year degree would be $11,299, which doesn't include extra costs for books, transportation, and room and board. The following chart shows projected future tuition and fees for undergraduate students at BYU - H.
Take note of just how much the tuition and fees are increasing yearly. At a lot of colleges undergrads will wind up spending more money on their last year of school than they did for their first.